BOM - Monday - 13 blocks to go. 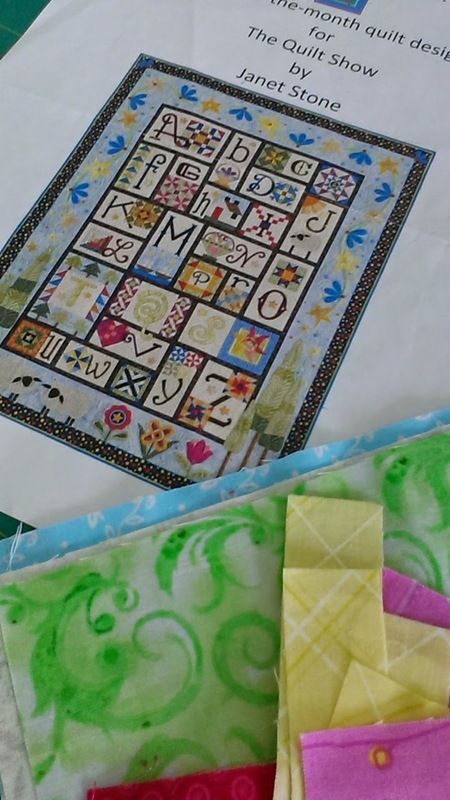 While south last year, I started to work on the A to Z Block of the month by Janet Stone. I just love the colorful blocks and the whimsical design. I did great keeping up with the monthly blocks while I was here in Florida last winter, but totally got behind after returning home. As summer approached, all work stopped on this in favor of Grammie Camp preparations which was followed immediately by wedding preparations for my daughter. I really love this pattern and don't want it to be a UFO, so it was the perfect project to bring south this year. We've been here almost three weeks already and if I don't start working on it now, it might not get done before I return north in the Spring. I have 13 letter blocks left to do and the borders. I'm aiming to get two letters done per week. I am hoping to get the borders done too. 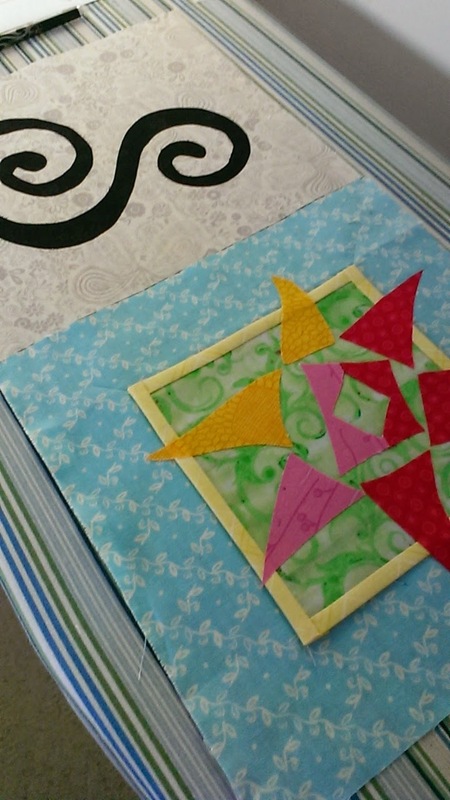 I have the "S" block started and I'm ready to do the machine applique. I haven't decided which additional block I will have done by next Monday but it will be a simple one. Stop by next week and see how I do. Here are three of my good friends and neighbours in Florida. 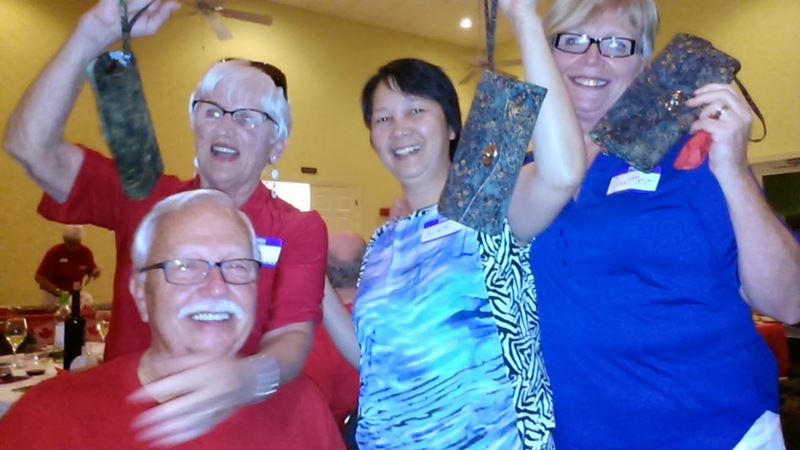 We planned a wallet class and we did it in two afternoons this week. Easy Peasy. Well, they weren't sure how all this was going to go together, and of course anyone who has taken the class knows that the last few seams, it all makes sense. We had a Canadian Dinner last evening and the girls were all sporting their new wallets. Looking good Girls!! Well, I totally forgot to do some blogging this week. 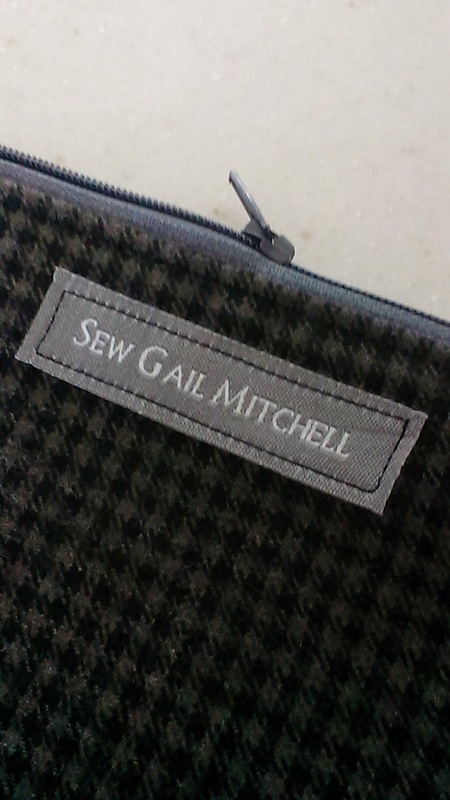 It's not been an especially busy sewing week but for my upcoming wallet classes, I did get my three class samples done. Now you might think that I mean that I have three completed wallets, but that is not quite the case. But first, I ordered beautiful batik fabrics to use. The fabrics have been cut into kits, I will use these kits when I teach this summer (July 17) in the Fredericton EdVentures Program. There are enough kits to do about 20 wallets. In this July 1-day class, there will be less than 15 students. I made a variety of kits, and students can have their pick of kits. This first blue batik wallet shows a very little bit of the sewing done, and some of the hardware installed. I used slightly different hardware. These are a little less forgiving than the ones I normally use for classes. I like them though. There are three colors of blue, with the dark for the outside, and the two lighter blues for the inside. The pattern seems a little winter like, so if you are "Blues Fan", this will be for you. 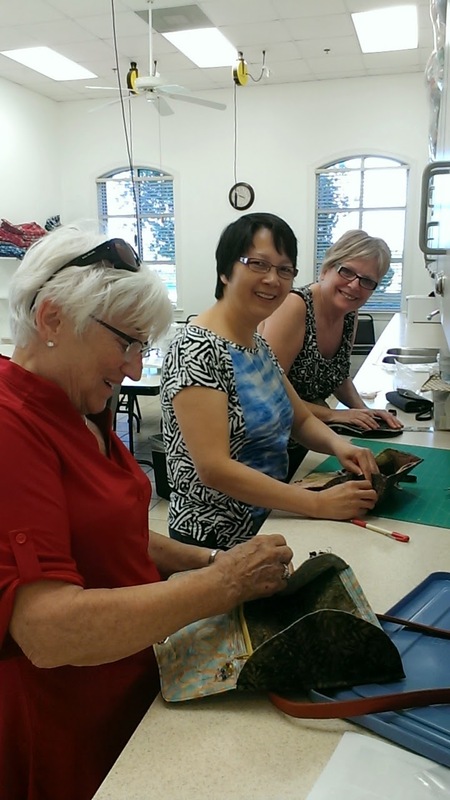 This second brown batik wallet, shows much of the construction done, and will show students how the final pieces are laid in place. 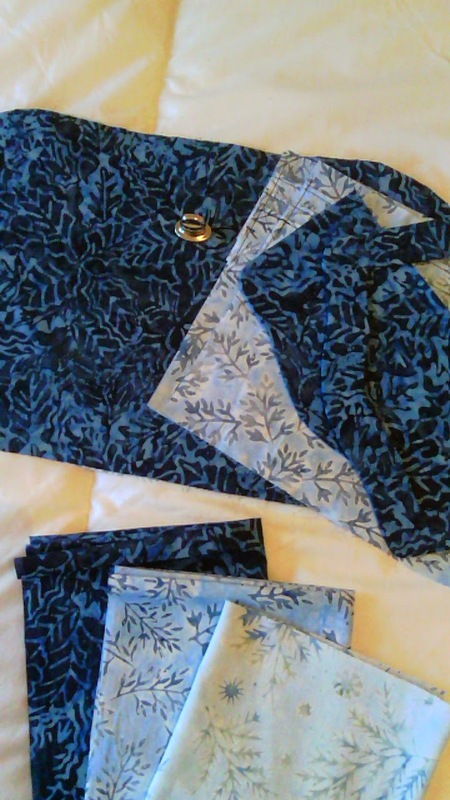 (although you can't see the inside) In this picture you can see that I have only used two fabrics. I really like it... for those who cannot decide on colors. It's simple... dark batik on the outside, lighter coordinating batik on the inside. 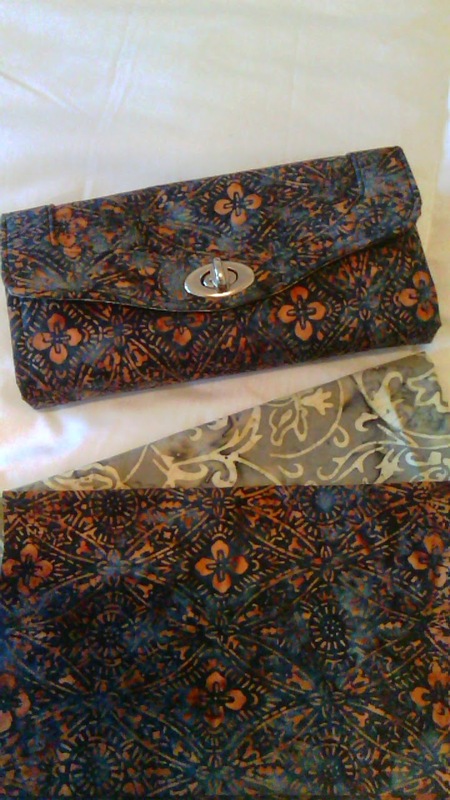 And of course, this wallet shows the final wallet and how it looks. It's made with a colorful but dark butterfly wing fabric. The inside are lighter and more colorful colors. If I was a student, I would have a hard time to pick which one I would want. I love all of them.. I do have one more set of fabrics to make a wallet, but I'll make that next week when myself and 3 friends will make wallets together. They will get to choose a fabric set from one of these. I'm anxious to see who picks what kit. I sew/make a lot of small projects. I give a lot of these small projects away, either as gifts or as donations. I've made some home made labels before, but I came across a place that sells custom woven labels and in a flash, I ordered up 50 labels. I received them yesterday and really like them. They are a little on the expensive side, (approx 50 cents each) and the shipping charge is a bit excessive, but I really like them. I've stitched one on a project that I have just started. This label will be on the inside of the project, so where ever this project lands up, it will have my label on it. I got them at http://labelsandribbon.com/ if you want to check them out. Happy New Year, Now let's get sewing! We have arrived at our home away of home here in Florida. I haven't sewed yet, but I did have fun setting up my sewing room. I have put a small table in the smallest bedroom to set up my sewing machine. I borrowed a kitchen chair and it's just perfect. 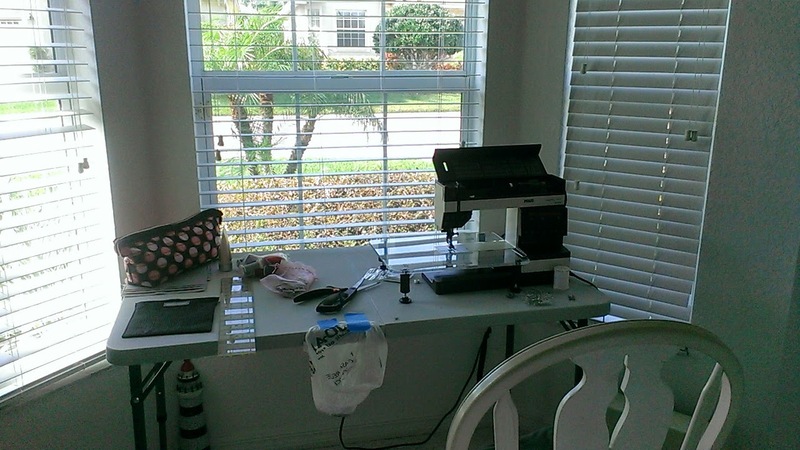 The sewing machine is set by a window which will give me great daytime light. My cutting board is set on a the perfectly sized bureau. I have brought a few sewing projects with me. 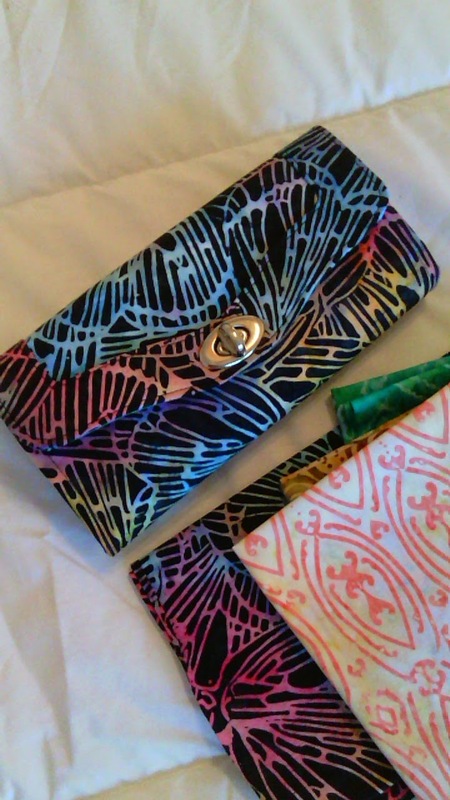 My first project will be to make 3 new wallets that I will use as class samples. I will be giving two classes in the spring, and I want to have new samples. Today, a quick trip to Joann's to get some interfacing, and I'll be ready to start.